Situated 6 km / 4 miles east of Luxor city itself (Al Uqsur) and close to both Al Bayadiyah and El-dabiya, Luxor International Airport (LXR) is an entry point for the popular tourist destination of the Nile Valley. 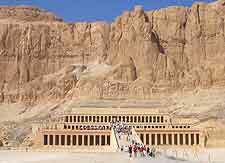 This is the closest airport to the renowned Valley of the Kings, which is situated just south of Luxor, and is currently Egypt's fourth-biggest airport. The airport has recently been upgraded to meet the needs of the growing air traffic and has been designed to handle some seven million passengers annually, being currently used by around one million. Luxor Airport covers around 740 acres / 300 hectares and features just one runway and comprehensive cargo storage. EgyptAir and AMC are currently amongst the main airlines. Two terminals serve international and domestic flights, with flights from Germany, France, Spain, Italy and the UK connecting directly with Luxor. Other international flights land at Cairo International Airport, from where 45-minute domestic flights connect with Luxor. Luxor truly is a city like no other and successfully combines the splendour of ancient Thebes with the hustle and bustle of a modern Egyptian city. A vibrant centre that offers surprises around every corner, visitors to Luxor can enjoy striking architecture and an abundance of dining and accommodation options. A gateway to many ancient treasures, Luxor Airport (LXR) is within close proximity of the Valley of the Kings, the site of many ancient temples and royal tombs including those of Ramases the Great and Tutankhamen. Another must-see is the seemingly endless Avenue of the Sphinxes, a sight sure to take your breath away.